A simple note on Encryption. Remarks: It's a very simple note on encryption. A crypto expert, could easily write a 800+ page text on this vast collection of subjects. And..., then that would then cover only the basic theory. Don't forget that new articles popup daily, covering new territory. Also, a large part of Quantum Computing deals on crypto- and related theories. I guess that I only want to say that the subject is "huge". if you were really new to the subject. 1. A few words on Symmetric encryption (shared key) and Asymmetric encryption (Public key/Private key). 2. A few words on Hashfunctions, Hashes and Digests. 3. A few words on Certificates. 4. A few words on Elliptic curve encryption. 1. A few words on Symmetric and Asymmetric encryption. in other sciences too, like in Quantum Mechanics to illustrate Quantum effects and observations. Suppose that Bob and Alice want to send "encrypted" information to each other. There usually is a stack of protocols on both sides, which makes it work. in Symmetric encryption/decryption and Asymmetric encryption/decryption. then they may use one single shared key, to encrypt and decrypt those messages. It's important to understand that both use the same key. This key must stay secret from other people and entities ofcourse. This is often seen as a weaker point in the protocol: that is: how to safely get the key to both parties? Maybe they need some sort of "secure" channel first, to transfer the key, for example from Alice to Bob. All encryptions/decriptions go by using the same one key. So indeed, Bob and Alice both use the same one key, which often is called the "shared key". In this case, a user has a Public key and a Private key. It's a "key pair". So, that holds for Alice and Bob too. The "private key" must be kept strictly private to the owner. The public key may be known to other user(s). can be decrypted with the other. So, if we take a look at Alice: she safeguards her private key, and never discloses that to another person. However, she may send her public key to Bob. Likewise, Bob may send his public key to Alice. -That Alice may use Bob's public key to encrypt messages. Bob can decrypt them, using his private key. -Bob may use Alice's public key to encrypt messages. Alice can decrypt them, using her's private key. -Any other user who intercepts such message, cannot do anyting with the encrypted data. 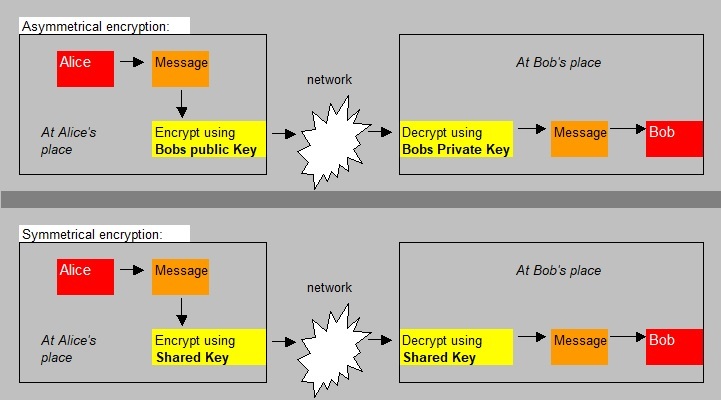 The Jip and Janneke figure below illustrates the difference between Public key/Private key, and Shared key encryptions. Fig 1: Just an illustration of Public key/Private key, and Shared key encryptions. Public key/Private key cryptography is generally considered to be "better" than Shared key cryptography. However, the first method is more involved and has a higher overhead. may intercept that key, and then this "someone", has the option to spy on the messages. Therefore a "2 Stage" approach is often used. then the encryption of data fully switches to the symmetric type of encryption. There are quite a few variants (sorts) of both "Shared key" and "Public/Private key" implementations. Although the general methods described above is true, the variants differ in bitsize, contruction of key(s) etc..
AES-128, AES-192, AES-256, RC4, RC5, RC6, DES. RSA (like RSA-256), DSA, Elliptic curve techniques. a "hash", or "digest", is an other sort of implementation. and maps to a certain output. In math, this is ofcourse an extremely well-known concept, like for example f(x)=2x+7, or f(x)=3x2 etc..
find the corresponding (output) value "3x2". Thus, suppose x=3, we have the output f(x)=3*32=3*9=27. A special class of functions in cryptography exists too. These are the hashfunctions. They can take data of variable length, and produce output of a fixed size. This output is often called "the hash", or "the hash value", or "the digest". two different inputs result in the same output, it's called a "collision". However, it should be understood that "in crypto appliances" these should be extremely low or non-existent. -If you let operate the hashfunction on some input, it produces certain output. If you again let operate the hashfunction on that same input again, then it must produce the same output again. then it always results in the same hash (or digest)." but say you have a given output, it should be practically impossible to find the associated input. Suppose we have a simple example of a "password hash", created by the password hash function Η. Note that the length of the hashes are equal. were found, and MD5 is currently not advised anymore. considered to be very strong. consider it to be rather secure. Indeed, it should be extremely difficult to derive the original text from a hash. like the system date/time, or cpu params etc..
but ofcourse they can be useful in other applications. You should see this feature, as a (sort of) special case of asymmetric encription. and with verification at the recipient, the Public key of the sender is used. The main purpose is to provide trust to a recipient, that a message is indeed from an intended sending party. "to sign" the message. The recipient then, uses the Public key of the sender to verify the signature. keys are used in encryption/decription. that she received from Bob, really came from Bob? This get's more urgent, if Bob is actually a Webshop, or financial institute, and Alice would be a customer. In the following, let's pretend that Bob and Alice indeed have such roles. or otherwise needs secure (encrypted) datatransfer. used at all sorts of purposes. Often, people refer to SSL/TLS certificates. SSL is actually an old protocol, and was replaced by TLS. Although many people still talk about SSL. Most of the time, people thus actually mean the SSL/TLS certificates, when talking about "certificates". Those are used in Internet traffic, to prove the identity of a Website, and to make encrypted datatransfer possible. Certificates can not only be used to enable secure Internet (SSL), but also for driver signing, code signing etc..
some identifiers which uniquely identify the Webshop (like the Domain, Organization, email etc..). can trust the certificate and the organization which holds the certificate (the Webshop). of the Issuer, which proves the validity of the Public key. You can also use a "self-signed" certificate, which does not need a trusted authority. This can be useful in a private Intranet, but it cannot be used for the Public Internet. which sits just "above" TCPIP, and which is involved in encryption/decription. where the "S" in HTTPS refers to "secure". Most Operating systems, and browsers, are equipped with a list of Trusted Authorities. all Internet trafic is using Asymmetric encryption, as we have seen in chapter 1. Bulk data encryption uses a shared (common) key, often also called the "session key". -Client connects to the Webshop. -Webshop responds with sending it's certificate with it's signed Public key. -Client creates a session key, encrypts it with the Webshop's Public key, and sends it to Webshop. -Webshop decrypts it with it's private key. -Both entities now have a shared session key, used in further encryption/decryption of data. Fig 2: Simplified illustration of the structure of a Certificate, used in an PKI infrastructure. -It contains Public Key information of the entity (like a Webshop) who now owns the Certificate. -It also contains information about the Authority which issued the Certificate. name like "CN=, OU=, etc..". Also, the certificate contains info on the Public Key and the identity of the named subject (like that Webshop). In some cases, a certificate may store your Private Key, for example in a request to a CA. There usually exists a "chain of certificates", or in other words, "a chain of Certificate Authorities (CA)". all the way to the "endpoint", which is called the Root Authority, with the Root certificate. That's why in diagrams, the Root Authority is often portraid on the utmost "right side" in the diagram. Since we cannot go higher than the Root Authority, Root CA Certificate is always signed by the Root CA itself. For example, the certificate issued for your Webshop, is an "end entity" certificate. issued by a CA which is included in the "trusted store" of the device or program or Operating System. So, usually all intermediate certificates must be in the store of the device or program or Operating System. Indeed, a given Server needs all the intermediate certificates. with all certificates in the chain. in something often called the "trusted store". The IETF is heavily involved in Internet protocols, and thus also in describing the X.509 (certificate) protocol. The regulations are documented in "RFC's" (requests For Comments). Originally, X.509 was decribed by ITU, in 1988, along other X.500 specifications. About the format, files, and purposes of certificates, a number of RFC's have been published. This is certainly not a simple document (for example, for me), but it describes a lot of the "in and outs"
of certificates based on X.509. of certificate files. However, there is not a one-to-one correspondence of extensions to formats. You might see *.cer, *.pem, *.crt, *.ca-bundle, *.cer, *.p7b, *.p7s, .der, *.pfx files, and a few more. Some of them are archives, containing a bundle of all intermediate CA's as well. Some of them can be used to transfer a Private Key (note that typically a certificate has info on a Public Key). How to install a certain certificate, depends on which sort of Web Server, or OS, or device etc..
a form of "Asymmetric encryption". This section is "optional" reading. But if you are interrested, then let's see what this remarkable stuff is about. Asymmetric encryption can be used for any sort of encryption/decription in general. -The general principles of Elliptic Curve encryption. -A specific case, namely how a Public key is derived from a Private key in the Bitcoin system. So, let's first take a look at the general principles of Elliptic Curve encryption. Note: In math, it is shown that the real general equation has more terms than is shown above. in a two dimensional plane, having an x-axis and y-axis. calculate the corresponding y value. You then will see that y=2x2 is a parabola. Ofcourse, here I took "x" to have integer values, but generally, this math is based on "real" numbers. You could plot an elliptic curve too. is generated using such curve. I will try to explain that in a moment. In ECDSA, once a Private Key is established, we go to work using the elliptic curve. That is, we use the elliptic curve, to derive the Public key. 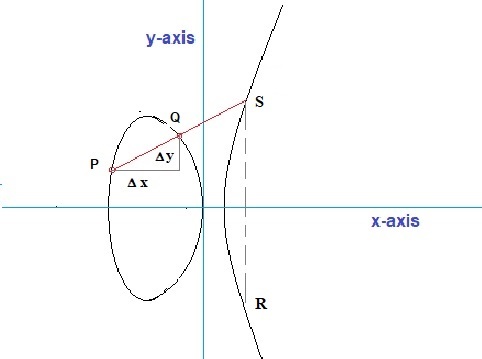 Fig 3: Just an illustration of a particular elliptic curve. 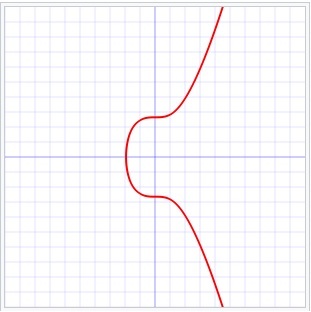 can vary greatly: just google on pictures of "elliptic curve", and you will see that variety. must hold that P+Q is also member of the group (thus also a point on the curve). It's tempting to view "+" as the addition operator, as is used in arithmetic. dealing on elliptic curves, the operator is indeed called "addition". looks a tiny bit different from simple regular addition, as is used in arithmetic. again a point "somewhere" on the curve. How would one geometrically, or algebraically, further define the exact mechanics of such an "addition"
for any members on an elliptic curve? since you want one result for P+Q, and not an unknown (variable) number of other solutions. that P+Q actually works. That is: producing a third point on the curve (member of the curve). Viewed this way, we can say that a line through P and Q, exactly fits our "construct". we must "flip" the "y-coordinate" of point S, to get the coordinates of R.
would go to "infinity", and never intersects the curve. the coordinates (x3,y3), if P and Q are expressed as (x1,y1) and (x2,y2). of the "y coordinate". Why we need to flip the y coordinate, will be explained later. Please refer to figure 3 again. We are going to solve "P + Q = S" in terms of coordinates. Let's call this gradient "λ". and thus we can find the coordinates of R too. will provide the solution for the untersection point "S". Believe me, it's just a bit of math, and nothing more. Above is just an outline. Before we can make this more concrete, we need to return to the purpose of this excercise. on that curve, might be nice, but so what? Instead of adding different points, like P and Q, we can also do "an experiment" like Q+Q. If you look at figure 3 again, you can visualize what it means. Take a look at figure 3 again. Now, let point P, along the curve, "crawl" towards point Q. At a certain moment, they coincide. The line through P and Q (actually through Q and Q), is now exactly the tangent line along the curve, at the point Q.
but I ignore that for a moment. 4.2. The Bitcoin Elliptic encryption "secp256k1" ECDSA Protocol. A specific implementation of "Elliptic encryption" is used by the Bitcoin system. That system might serve as an example of such an implementation. -Here, the "secp256k1" SEC (Standards for Efficient Cryptography) specification is used. This specification lists all relevant parameters for a specific elliptic curve and encryption. from the general equation "y2=x3 + ax + b" and with "a=0" and "b=7". Fig 4: Just an illustration of the secp256k1 elliptic curve y2=x3 + 7. Source: Wikimedia commons (Public Domain). of numbers for which the specification is set in "secp256k1". Using this set of "x values", produces a discontinue scatter diagram (not shown in this note). -A base point on "the curve" is defined, rather randomly, but once chosen, it is fixed. Where kprivate is a 256 bit number. Note that the equation above, is not much different from an equation as "n * G = G+G+...+G (n times)". to calculate the Private Key, from such Public Key.